Red flags are warning signs. Signs to proceed with caution or perhaps not proceed at all. A red flag is our intuition (inner guidance) making us aware of a potential issue. Red flags can be subtle so it’s important to be mindful and consciously aware. In other words, pay attention. For me, red implies stop as in a red traffic light or stop sign. Red seems to be a universal sign for stop. The turn off button on many of my devices such as my TV remote, computer, and radio in my car, is red. Even in my profession as a Professional Registered Nurse, when I see blood (red), it is a sign to seriously evaluate the source and STOP the bleeding (red). How many times have I ignored the red stop sign or traffic light while driving? And I have the dings on my car to prove it. It is the same in my personal life. How many times have I ignored the red flags and ended up with mental and physical dings. The Universe (spirit, inner GPS, intuition) is constantly guiding me on my journey and throwing up red flags to stop me when there is danger ahead. The issue has been my tendency to be a little hard-headed at times and just go my own way despite the red flag warning. How many times have I continued dating someone when there were clearly red flags? How long have I stayed in relationships when the red flag (stop sign) was right in front of my face? I once met this man who I was sure I was in love with. After only 6 months, we moved in together. The red flags started popping up immediately and continued to pop up on a regular basis throughout the next 2-½ years. Yes, I stayed that long. That is the hardheaded part of me I talked about earlier. It is easy to tell oneself, “the red flag will go away”, or “he will change.” I am learning that the red flag is there for a reason and I need to pay attention to it. The mere fact that you are trying to change someone is indeed a red flag in and of itself. I love what Maya Angelo said, “When someone shows you who they are, believe them.” I will take it a step further and say when a situation shows you what it is about, believe it. Ignoring red flags in my life has certainly caused me my share of hurt and pain. The flip side to that is, they have also taught me great lessons. Unfortunately I did not always learn the lesson the first time around so I ran the stop sign again and again. I have been guilty of ignoring the same red flag over and over. I guess that’s necessary at times until we learn the lesson that the red flag is there to teach us. Do red flags mean the relationship is over? Not necessarily but could be. They definitely mean it’s time to stop and evaluate the situation. I believe there are times when the red flags can be turned green for go if they are addressed appropriately. To ignore them and pretend everything is okay is not a healthy solution. The Universe will always have your back if you allow it to. Listen to it. No special powers needed to be able to see the flags. Just awareness. I look forward to hearing about your red flags and any solutions you may have about how to deal with them. I hope you will also follow me on Facebook, Twitter, LinkedIn, and Instagram. You can enter your email address on my website to follow my passion. I would be deeply honored. Hi Vince! No more perfect time for me to read this than today! I decided to take a career break , then was offered a position 2 weeks ago with a very demanding, condescending , unhappy woman. Red flags were all there from the get-go & hubby said Do Not take the job. My nurturing side would be compromised if I stayed there so tomorrow morning I will be leaving. I’ve always listened to my intuition fervently in the past , not sure why I’m struggling at this age. Most likely, just more hard headed lol! The sooner we recognize the red flags and have the courage to move on, the more peaceful our lives become. Thanks so much for sharing. Much love to you. Bigger and better things ahead for you because you recognize your value. Hope sometimes needs help. I don’t know that everyone thinks about hope needing help. Excellent point. Thanks for the thought. Hope all is well with you and as always, I am so honored to have your support. Great message! 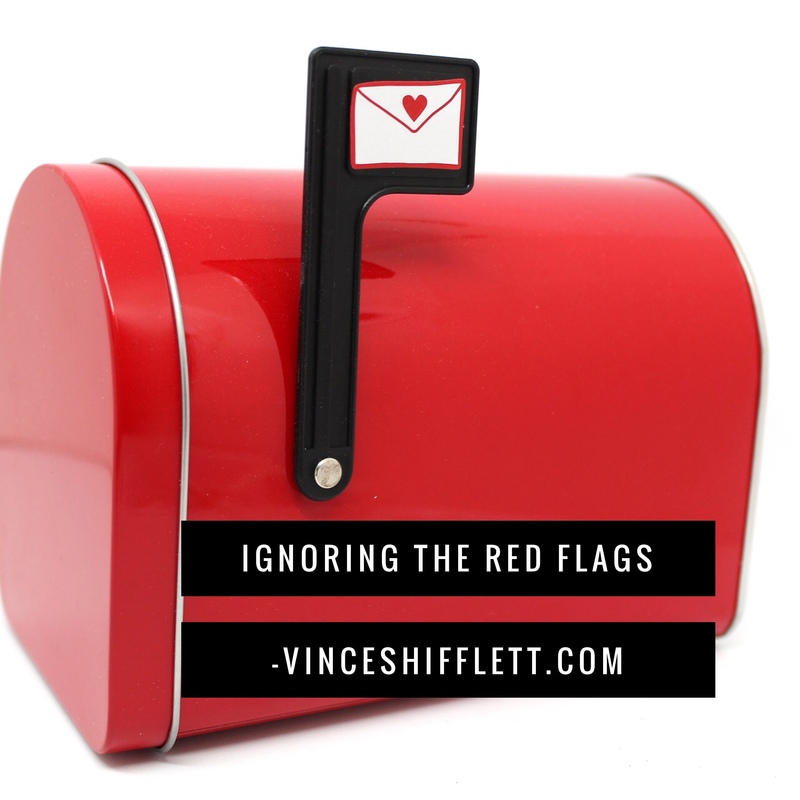 There have been times I ignored the “red flag “ and paid dearly for it but you live and learn throughout life. Have a super Sunday…..
You have a great Sunday too.